The recent discovery of a third daguerreotype of Victorian-era poet Emily Dickinson has historians scratching their heads. Long believed to be reclusive and camera-shy, Dickinson seems to paint an entirely new picture of herself, positively mugging for the paparazzi. Until Tweetspeak staffer Tania Runyan discovered the new daguerreotype by chance at a yard sale near her Chicago home, only two likenesses were known to exist of the beloved poet and literary enigma. The second, discovered in 1995 and only recently made public, has yet to be fully validated as a true image of Dickinson while textile, ophthalmological, and computer-aided analysis continue. The newly-found daguerreotype bears distinct similarities to the recently publicized image featuring likely sitters Dickinson and longtime friend Kate Scott Turner. 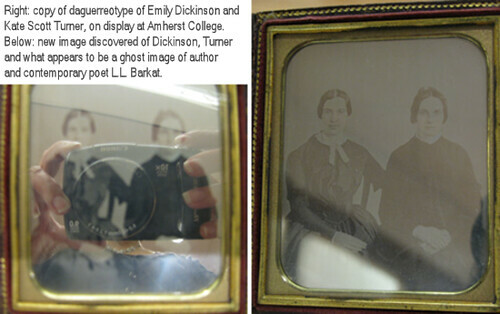 In addition to the original, only two copies of that daguerreotype exist, one of which is currently on display in the Amherst College Archives and Special Collections. Researchers speculate that the second and third portraits may have been taken at the same time. Dickinson is seen wearing the same outdated dress currently undergoing textile analysis with fabric samples located by the Emily Dickinson Museum. However, the most recent find features a ghost image that is believed to be that of author and contemporary poet L.L. Barkat. Barkat, much like Dickinson, is rarely seen in photos, most public images stopping at the shoulders. T.S. Poetry Press researchers continue their cameratology analysis through digital enhancement in the basement lab at the publisher’s New York headquarters as they attempt to verify whether the Canon Powershot SX110 seen in the ghost image is the same photographic equipment visible in similar reflective self portraits of the elusive author. The new daguerreotype is available for viewing in the Tweetspeak Archives and Museum. Visitors are advised to call ahead for an appointment. Emily Dickinson Daguerreotype photos by L.L. Barkat, taken at Amherst College Archives and Special Collections. Used with permission. Post by LW Lindquist. Hilarious. Well-done, Lyla. Now I want to see your recipe for spiked cider, er, sweet tea, preferably in the form of an ode. What I want to know is, is that Emily’s fingers on the camera? Perhaps she was taking a picture of the daguerrotype, channeling a Canon Powershot SX110. Poetry is, after all, timeless. Let’s be serious, has this been taken to the next level yet? Does anyone know of a good opthamologist who can verify if those hands belong to ED? Maybe at the same time, they can check out the lens. Oops, I’m getting mixed up.